Have You Assembled An Effective Hiring Structure? At #TeamOnsharp, we’re always looking for ways different industries can improve their websites. Right now, we’re focusing on the construction industry and how you can improve your hiring process on your website so you can get the best applicants. When you think about your website’s hiring process, is it simplified and easy to follow? If not, you could be driving away the best construction candidates in the industry. Lengthy and complicated online job applications are common, but employers are underestimating the impact these complicated processes can have on recruitment. We’ve done some research and have found what we believe can help you improve your hiring process to attract the top applicants in the construction industry. If you have vague job descriptions, the best candidates will assume you don't know what you're talking about or what you're looking for. To avoid making this poor first impression, explain what the candidate will be doing, why they should work for you, and what experience is required. This will give them a clear understanding of what the job is and if they think they're a good fit. Including questions may be appropriate for some positions, but oftentimes it's best to save questions that require detailed answers for the interview. Take some time to analyze what you're looking for in your candidate and only choose questions that would make or break their qualifications as a potential employee. If your job listing is mixed with information on a page that doesn't relate to job openings, there's a good chance your listing will be overlooked. Creating a separate landing page specifically for job openings is a great step to get prospective employees to search for what's available. 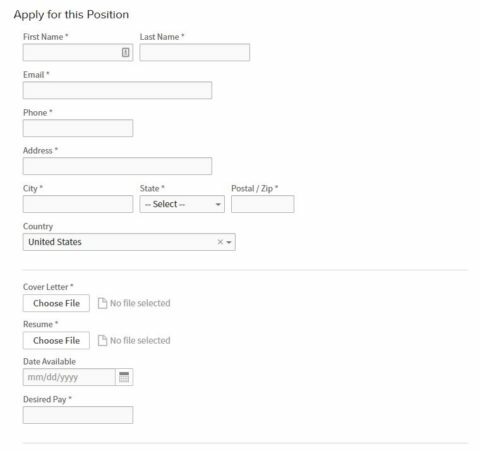 This also makes it easier on your end as you'll be able to update and organize your information as positions are filled. Making it easy for qualified candidates to apply is a must. An online portal is a great way for candidates to submit their application instead of directing them elsewhere. As you can see, this form makes it easy for an applicant to fill out their basic information, and it gives them an opportunity to easily attach their cover letter and resume. Does your construction site have these hiring features on your website, or are you losing potential applicants? While there are several aspects of your website that need to be analyzed, it may be best to have one of our experienced website developers determine what work needs to be done to make it as user-friendly as possible. If you need to make some website changes to attract the best applicants for your construction business, get in touch with us! We’ll be happy to help.